Eugène Galien-Laloue – Callaghans Fine Art Dealers. Title: Le Moulin Rouge. Date: c.1920-1930. Materials: watercolor and gouache. Dimensions: 29.2 x 50.2 cm. 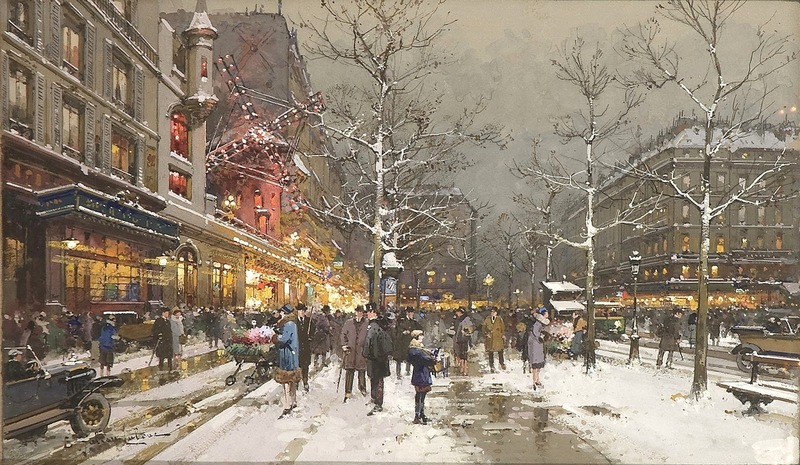 Source: http://4.bp.blogspot.com/-bOSVYPIo9Cw/UjRJTlEYfFI/AAAAAAAAPpU/K6CwbNpOzF8/s1600/EUGENE+GALIEN-LALOUE+-+Moulin+Rouge+-+Aquarela+e+guache.jpg. I have changed the light and contrast of the original photo.